I wonder if this lady is Scottish. She could be, dressed as she is in tartan to complement her Scottish breed: a West Highland White terrier. 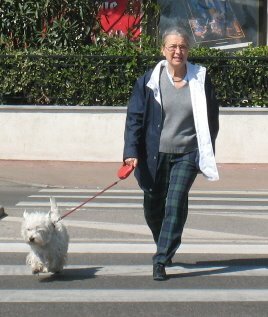 Here they are crossing the road in Carnoles at Roquebrune cap Martin. One thing I have always felt, sometimes dogs are better people. Our little Winston just turned 12 years of age yesterday. He is a West Highland White Terrier, a mischevious little imp. Full of love, energy, and causing trouble. He is so much fun!